GM has replaced over 1,600 metal halide fixtures with LEDs in its plant in Lordstown, Ohio, and will swap out 4,000 more this summer. GM's Stamping Plant, where the Chevrolet Cruze is built, covers 6 million square feet (557,000 sq. m), and the lights are 40 feet (12.2 m) high. In the initial phase of the retrofit, GM replaced 1,328 1,000W and 283 400W metal halide lights, over 815,000 square feet (75,700 sq. m), with 1,246 LED solid-state lighting fixtures ranging from 90 watts to 360 watts. The expected energy savings, a massive 84 percent -- or $780,000 per year -- don't come from the greater efficiency of the LEDs alone. The smart control that is built into every fixture the project could account for is as much as half of the savings (my estimate). Last April we profiled a smaller retrofit, similar in nature. 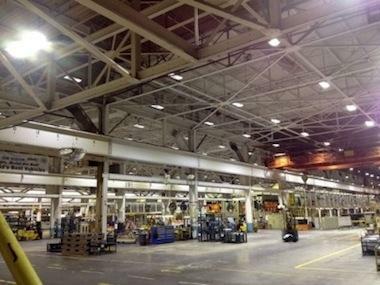 A Massachusetts manufacturer, Mack Technologies, had replaced T-8 fluorescents with LED fixtures over 130,000 square feet of manufacturing space. They saw an immediate 40 percent reduction in power usage for lighting, and expected that that figure could nearly double once they gained experience with the lighting control system. At Mack, the controls were provided by Daintree Networks, and they were added at installation time to fixtures sourced from Lithonia. Daintree's wireless controllers are based on the ZigBee (IEEE 802.15.4) open standard for mesh networking. In the case of GM's Lordstown plant, the wireless controllers are built into each fixture by the manufacturer, ALLED Lighting Fixtures of Ellwood City, Pa. ALLED's "ALLink" controllers are based on the SNAP wireless mesh networking operating system from Synapse Wireless; its underlying layers are also 802.15.4. At Lordstown, the lighting control network was integrated into GM's building management system. Plant managers can customize and schedule light levels based on the tasks being performed in each work area, and can dim the fixtures during breaks or shift changes. The lights sense the level of daylight and automatically dim when sufficient outside light is available. Additional wireless light switches along the aisles allow for manual control of the lights outside of the building management system. ALLED's president, David McAnally, is quoted in the company's press release saying that the GM retrofit is "the world's largest indoor LED installation with this type of built-in, fully integrated wireless control system." I don't have statistics one way or another to know if this is so, but in any event, GM declared that Lordstown is that company's largest energy-saving conversion to date in North America. If the plant sees proportional energy savings in the areas to be converted to LED lighting this summer, GM could end up realizing $2.7 million in annual savings at its Lordstown facility.